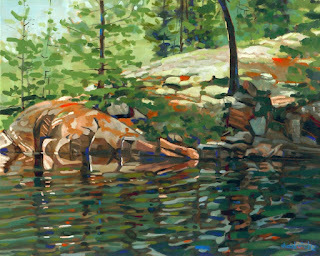 Phil Chadwick's Art: #0525 "Shoal Lake - Granite Shore"
#0525 "Shoal Lake - Granite Shore"
This is the southerly end of Shoal Lake as it appeared during the fishing trip to Shoal Lake from our home base on Bass Lake of Restoule Provincial Park. The granite shore is to the right as you face the creek leading to the Bass Lake portage. My canoe buddy and I joked that we should be the custodians of the lake and that the ranger's cabin could be on this granite point. It would have been a pretty spot to live. Every blank canvas is another chance to learn something new. This painting flowed as easily as my Kevlar canoe.